Protect your PC against Spyware, Malware and other unwanted software. SPYWAREfighter is a user-friendly anti spyware program that is easy to install and use,Spyware Protect your PC against Spyware, Malware and other unwanted software/ annoying pop-ups, unwanted changes to Internet settings, and unauthorized use of your private information. Continuous protection improves Internet browsing safety by scanning for more than 220.000 known threats. ...... help you on phone or email. Suspicious files will be rendered harmless and stored encrypted in the quarantine. The guard supervises your system in realtime and protects it against infection with malware. Makes it possible to scan also in archives like Zip and RAR for pests without creating temporary files. 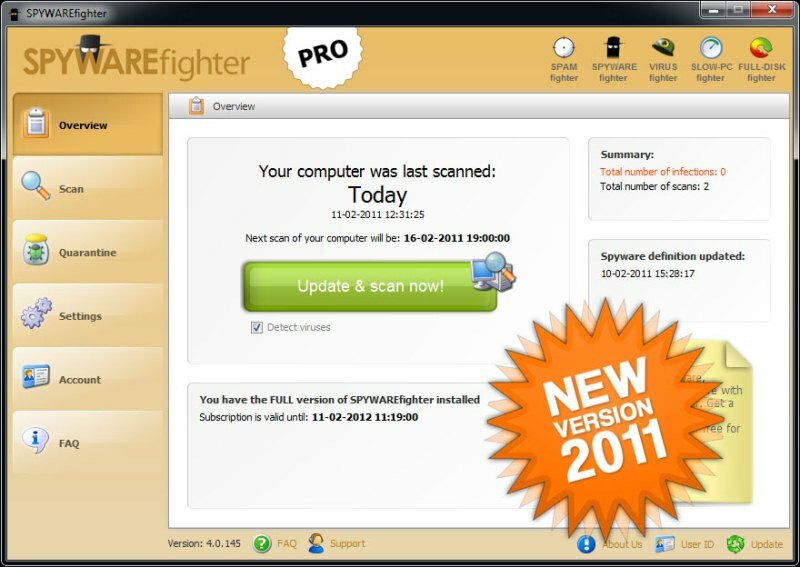 The updates of SPYWAREfighter anti-malwares are released incremental. This means only new signatures or changed files have to be transferred, thus saving a lot of time and traffic. Also damaged or modified components will be exchanged automatically via online updates. An unintentional deactivation of the guard by pests will be prevented. Scan and remove online threats from your computer. Detect, destroy, and prevent viruses, Trojans, and other threats from your HDD. Protects privacy by clearing activity history. Anti-Spyware Tool which scans, cleans and protects your system form spywares. Scan PC for Spyware, Adware, Dialers, and Web Bug traces. Spyware Scrapper is a strong spyware remover utility. Qweas is providing links to Spyware Fighter Downloader 4.0.254 as a courtesy, and makes no representations regarding Spyware Fighter Downloader or any other applications or any information related thereto. Any questions, complaints or claims regarding this application Spyware Fighter Downloader 4.0.254 must be directed to the appropriate software vendor. You may click the publisher link of Spyware Fighter Downloader on the top of this page to get more details about the vendor.